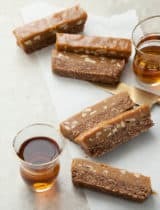 Sweet date caramel and roasted pecans are sandwiched between layers of crisp and crumbly dough in these paleo and vegan date squares. 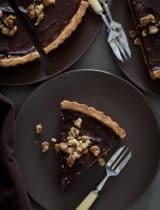 Time has a habit of getting away from me; there is always so much to do and never enough hours, which is why I like having a few quick and easy dessert recipes up my sleeve when I need them. 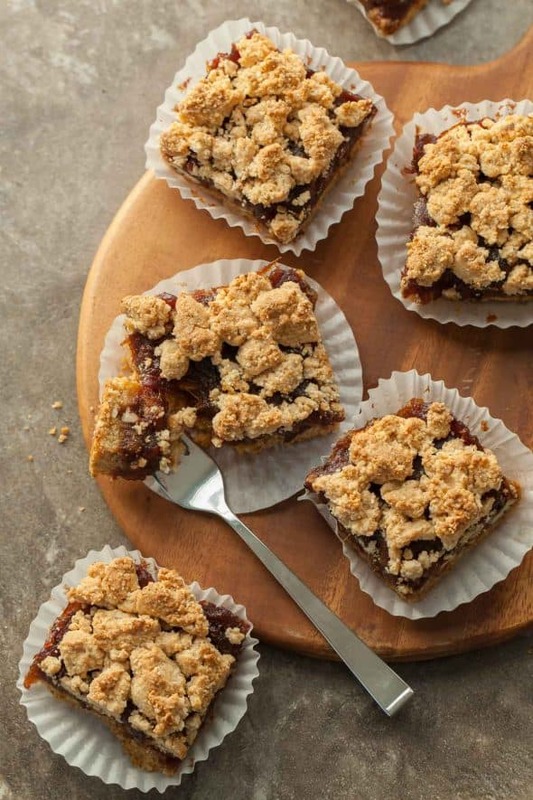 With the holidays around the corner, having a go-to cookie or bar recipe to turn to can be a real life saver, and these pecan date squares are just that. 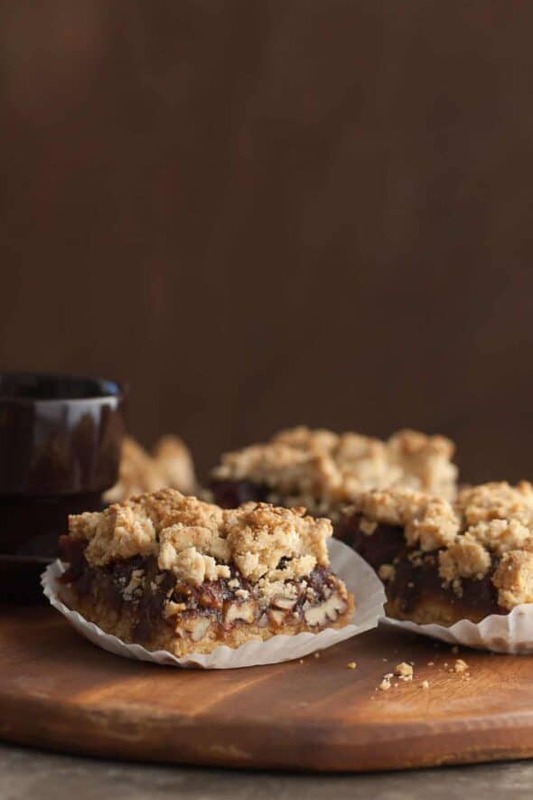 Date squares are one of those quaint old-fashioned bar cookies that seem right at home around this time of year. Sweet, crumbly and filled with gooey date caramel, they’re both enticingly crisp and chewy. 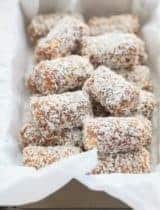 Similar to a jam bar, these date bars feature a dense sticky caramel made from Medjool dates and coconut syrup that’s sandwiched between a shortbread-like base and a crisp crumbly top. 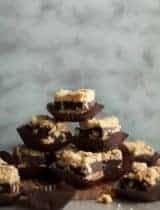 I’ve added both toasted pecans and a hint of cinnamon and vanilla to the caramel filling for extra texture and a little fall/holiday inspired flavor. It’s simmered quickly on the stove then spread onto the crust. 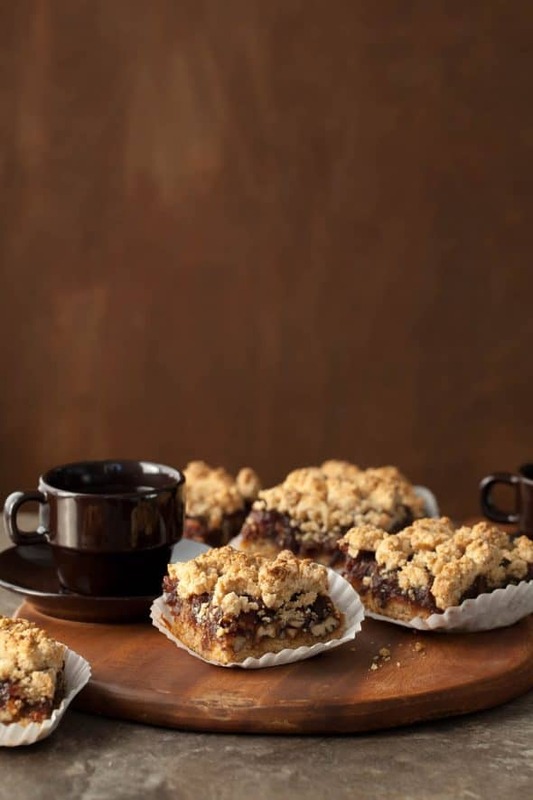 The crust and crumble are a one bowl affair; everything is easily stirred together by hand then patted into the pan, reserving a portion for the top which is then pinched and clumped together by hand to form large crumbs. 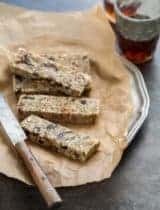 What I love so much about these date bars is that you can whip them up in less than an hour with ingredients that are easy to keep on hand and have something ready for dessert when you’re in a hurry and don’t have time to run to the store. 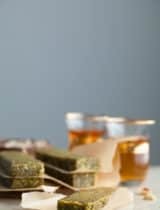 They make an excellent afternoon snack or even breakfast in a pinch, and keep well in the fridge or freezer so you can always have square within reach at a moment’s notice. Preheat oven to 350 degrees. Line a 8 x 8-inch baking pan with parchment paper, leaving an overhang. 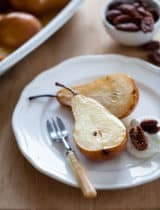 Place pecans on a sheet pan and bake for 5-7 minutes until fragrant and lightly toasted. Remove from oven and set aside. In a small saucepan, combine dates, coconut nectar, water, vanilla, cinnamon and salt. Cook over medium-low heat, stirring frequently until thickened and jam-like in consistency (3-5 minutes). Stir in toasted pecans and set aside. In a large bowl whisk together flours, baking powder and salt. Stir in maple syrup, coconut oil and vanilla extract until evenly moistened. Transfer 2/3rds of mixture to prepared pan and press firmly into bottom. Spread pecan date mixture evenly over crust. Using your hands, pinch and squeeze the remaining dough to form crumbs . 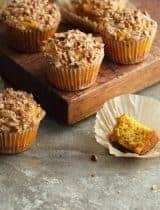 Evenly distribute crumbs over filling. Bake until topping is golden brown and filling is set, (about 25 minutes). Let cool completely in pan on wire rack. Using parchment, remove from pan; cut into squares. Freeze or store bars in an airtight container in the fridge for up to a week.